Ahem. 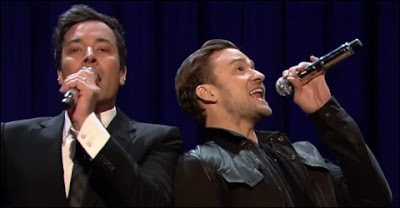 Last night, Sir Justin of Timberlake rounded off his week-long stint on Jimmy Fallon's US Chat Show with the fourth installment of their increasingly amazing "History Of Rap" medleys. This time they squeezed in The Beastie Boys, Jay-Z, Missy Elliot, Nelly, Eminem, A Tribe Called Quest, Salt-N-Pepa and even Macklemore's recent number one Thrift Shop. Surely they've got enough material now to stage a tour. I'd be there. How about you?